yes, yes, I know it is an awful pic. Had problems getting WIFI working on my camera yesterday so it is a photo of a photo. If not good enough I can try to get technology to work again. At my feeder yesterday (actually there were 3 of them) mixed in with the finches. I live in mountains of western NC - at about 3k feet in elevation. maybe. But has some significant differences from my other goldfinches (of which I have a horde). - the back is orang'ish, not olive, the wing bars are orange'ish, it is a little larger, has only a yellow chin/breast not the belly (the belly is white), and the wings are jet black. It looks like an American Goldfinch in typical non-breeding plumage to me. Looks like a juvenile in beautiful, fresh plumage. But we agree it's an AMGO? 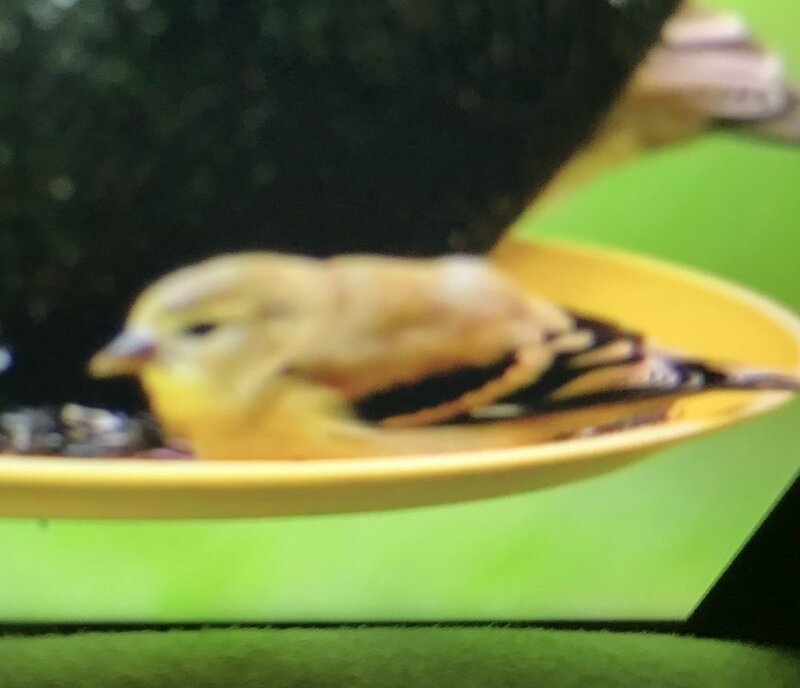 Yes, it's definitely an American Goldfinch. Arghh.... I relent to your collective wisdom. I checked a field guide again for all variations - the one labeled “juvenile” seems spot on. Which guide, if I might ask? This is an American Goldfinch, no doubt. When making IDs by looking at a picture or drawing in a field guide, it's important to remember that all individuals might not look exactly like the depiction in the guide. There's a lot of individual variation in birds and many other reasons why all birds of various ages/sexes might not look exactly alike. National Geographic Field Guide to the Birds of North America. 6th edition. Page 523. It's also a male, as discerned by the very black wings; females' are dark brown.